Four processors share their experiences of package lightweighting. Designing an environmentally friendly package can be complex, but in some cases the direct route is best — just use less packaging. This may mean eliminating package components, using less packaging material or switching to lighter-weight materials. In addition to reducing the amount of packaging ending up in landfills (or requiring resources to recycle), using less packaging drives down energy use for package manufacturing and reduces greenhouse gas emissions generated by transporting the packages to and from the processor’s plant. “There are multiple strategies that [processors] are using for reducing packaging waste,” says Jeff Wooster, global sustainability director for Dow Performance Packaging, a business unit of Dow Chemical Co., Midland, Mich.
Another approach is to reduce package weight. A processor might switch to a plastic bottle that contains 18g of plastic rather than 20g, for example. “As you think about the whole [packaging] system, it’s important to recognize that the biggest impact you can have is by reducing the amount of material you use at the beginning of the process,” Wooster says. “That carries all the way through the life cycle,” from package manufacturing through to end of life. “It’s useful to increase recycling or recovery at the end of the product’s useful life, but it doesn’t have as much of a positive impact as reducing the amount of material at the beginning of the product’s useful life,” he explains. 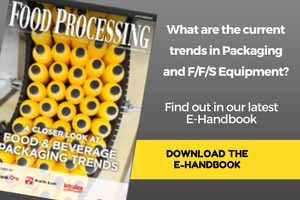 Processors get the message; their tales of package lightweighting and source reduction are popping up almost daily. The following examples are drawn from brand owners in the U.S. and Europe who sell products ranging from biscotti to wine. Since 2009, Hershey Co. , Hershey, Pa., has worked on more than 175 packaging sustainability projects in the U.S., Mexico and Canada, reducing its packaging-material use by 14 million lbs. The company’s most recent project focused on reducing the weight of wrappers for chocolate bars in Hershey’s Miniatures Assortment bags. Although the new labels are only 0.05g lighter than the old ones, the high sales volume of Miniatures translates into a significant reduction in paper and foil. “It’s a small change on a small label, but if you think of the volume we sell of Miniatures, it’s pretty huge and it certainly does add up very quickly,” says Melinda Stamm, senior manager, packaging development-chocolate. More than 16 stock-keeping units — including everyday items, seasonal Miniatures and Hershey’s Special Dark Miniatures Assortment — were included in the wrapper project. Figures from Hershey indicate that the change saves more than 271,800 lbs. of wrapper material annually. Both the paper and the aluminum foil in the laminated wrapper were reduced, with paper savings equaling 1,957 trees per year and energy savings (for aluminum production) equaling the electricity needed to power 56 homes for a year. “Thinking small can [yield] big payoffs,” Stamm says. With any packaging-reduction project, finesse is required to meet sustainability goals while maintaining product protection. Such was the case with the Hershey’s Miniatures project. In addition, the company wanted to be sure the “entire consumer experience was maintained,” Stamm says. Producers of private-label products also are finding ways to reduce packaging materials without sacrificing product quality or brand perception. Gruppo Francia, Sonnino, Italy, recently switched to a lighter, thinner-walled plastic tub for Cucina Mozzarella di Bufala Campana. Aldi sells the private-label product at its stores in Germany. At Aldi’s urging, Gruppo Francia began exploring ways to reduce the amount of plastic in the package while still providing a premium look and feel for the product. Like the previous package, the new tub is polypropylene. However, it’s 44 percent lighter because the walls are significantly thinner. RPC Superfos, a business unit of RPC Group, Rushden, Northamptonshire, U.K., supplies the tubs, which are from RPC Superfos’ SuperLight product line. With the lighter tubs, “you’re talking about a wall thickness that’s below 0.38mm, which is a 50 percent reduction compared to our standard products, which have a wall thickness of 0.6-0.7mm,” explains Torben Nielsen, RPC Superfos’ sales director for Italy and Malta. In addition to reducing carbon footprint — the lighter package uses less plastic and is more efficient to transport — the injection-molded tub maintains shelf appeal with graphics-friendly in-mold labeling. The label is also polypropylene, so recycling is straightforward. The 125g product is designed as a “mono portion,” he adds. Because reclosability is unnecessary, the package has no overcap, just a heat-sealed membrane across the top of the package. Even glass packaging is losing weight: Witness new lighter glass bottles for the full range of wines from Snoqualmie Winery, Paterson, Wash. The company announced the update in April. Snoqualmie reports that the new bottles for its two wine tiers — the Eco (formerly Naked) organic tier and the Columbia Valley tier — are made with 25 percent less glass than conventional wine bottles. Ardagh Group, with North American headquarters in Muncie, Ind., supplies the bottles. The new bottles were crafted to assure the package’s performance despite the reduction in glass, according to the bottle supplier. Although consumers sometimes associate the heft of a wine bottle with the wine’s quality, that perception has not touched Snoqualmie. “For the higher-end luxury brands — say a $50 bottle of wine — yes, definitely, [heavy] says luxury, and they have very heavy bottles,” says Kirsten Elliott, senior marketing manager for Snoqualmie. Snoqualmie also made several other environmentally friendly choices when it redesigned its packaging. Its new corks are certified by the Forest Stewardship Council and Rainforest Alliance, and the new labels are made with 100 percent post-consumer fiber. And its new white-wine labels, supplied by Smart Planet Technologies Inc., Newport Beach, Calif., are made with less plastic than labels typically used on bottles of white wine. Another approach to reducing packaging is to eliminate unnecessary package components, which is what Nonni’s Foods LLC, Oakbrook Terrace, Ill., did. Earlier this year, the company announced it had removed the clear polystyrene trays from 85 percent of its retail biscotti cartons. Nonni’s estimates its dramatic tray reduction will reduce its plastic use by 148,840 lbs. — the weight of 7.5 million trays — in 2014 alone. Because polystyrene packaging typically is not collected in curbside recycling programs, these numbers, to a large extent, reflect reduced waste to landfill. Getting rid of the trays also will reduce greenhouse gas emissions by eliminating 12 semi loads of empty trays coming into Nonni’s production facility annually. To determine whether its biscotti would suffer from the elimination of trays, Nonni’s worked with a third-party testing company to see if product breakage was greater when trays were removed from the cartons. The firm did drop and shake testing, and Nonni’s performed its own UPS and pallet-shipping tests. The test results showed “there was no measurable increase [in breakage] on any of the chocolate-bottomed items” in packages without a tray, says Matt Duffy, director of marketing at Nonni’s. This information cleared the way for removal of the tray from packaging for eight of Nonni’s nine biscotti varieties. The company still uses the tray-in-carton package for its Originali variety. The Originali Biscotti are not dipped in chocolate and are more fragile than the other varieties; therefore, they require a more protective package.